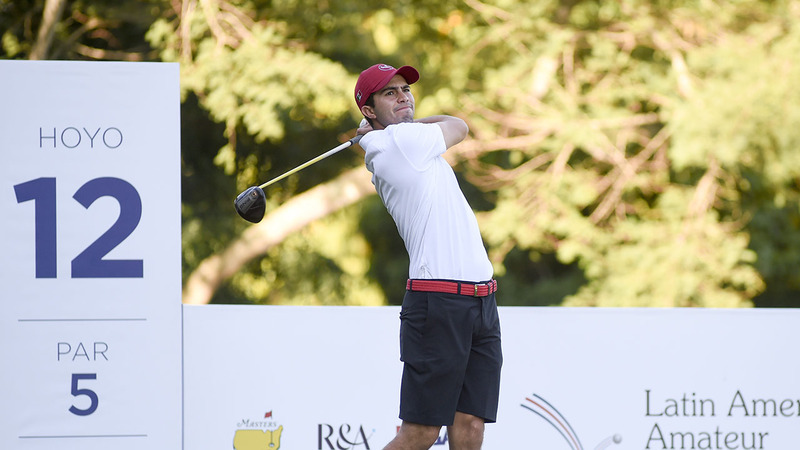 Alvaro Ortiz carded a 2-under par 70 Saturday, has a 54-hole score of 208 (-8) and leads by one stroke with one round left to play at the Latin America Amateur Championship, played at Teeth of the Dog Golf Course in Casa del Campo, Dominican Republic. Julian Perico is even par (216) through three rounds and is tied for 17th. Ortiz got off to a strong start with birdies on holes 2, 5 and 7 to make the turn at 3-under par. The opened the back nine with a pair of bogeys but ran off six pars before finishing with a birdie on 18 for a round of 70 (2-under par). Perico, who started the day in eighth, shot 40 on his front nine. He got on track with a birdie on the par-4, 11th hole. However, he gave that stroke back with a bogey on the 12th. Perico rallied and birdies holes 15 and 18 to finish the day with a 2-over 74.